There is a new bad boy in town. And it simply commands respect. The Jaguar F-TYPE Coupé has taken its rightful place in our exclusive Dream Collection of élite, luxury brands. Powerful, agile and distinctive, F-TYPE is a true Jaguar sports car, engineered for high performance and instantaneously responsive handling - the latest in a distinguished bloodline. Supercharged engines, lightweight aluminium body construction and advanced driving technologies deliver an experience that is intuitive, instinctive and alive. Exclusively available to rent now at selected Hertz locations in Europe. Rent the unforgettable Jaguar F-TYPE Coupé exclusively through Hertz and experience the drive of a lifetime. 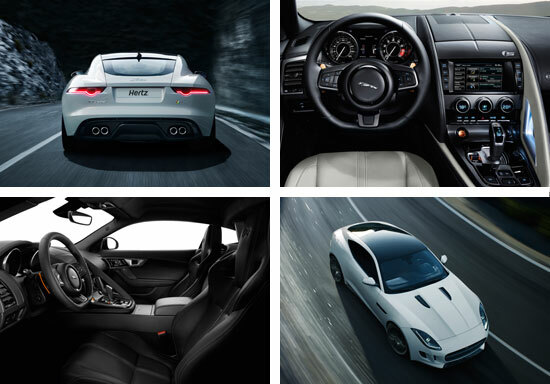 • The Jaguar F-TYPE Coupé is available at selected pick-up locations in France, Italy, Spain, Netherlands and Belgium. • This make and model is limited and subject to availability and change without notice. • Minimum rental age is 30 years old. • Other conditions may apply, please see the specific Rental Qualifications and Requirements for each country for full details.